Some options in stock. Order in the next 9 hours, 47 minutes and it will go out today! The most wide-ranging choice of wooden wands available on the market. Each style, colour and texture is different. Sorcerer's Wand - DARK BL15 - Approximately 15 inches. Sorcerer's Wand - ELDER BL1 - Approximately 14 inches. Sorcerer's Wand - GHOST BL12 - Approximately 15 inches. Sorcerer's Wand - GOBLIN BL8 - Approximately 13.5 inches. Sorcerer's Wand - LEVITATION BL23 - Approximately 14 inches. Sorcerer's Wand - LIGHT BL6 - Approximately 14 inches. Sorcerer's Wand - POWER BL9 - Approximately 15 inches. Sorcerer's Wand - SORCERER BL4 -Approximately 14 inches. Sorcerer's Wand - DARK SPELL BL33 - Approximately 13 inches. Sorcerer's Wand - STUDENT BL5 - Approximately 15 inches. Sorcerer's Wand - WHITE MAGIC BL17 - Approximately 14 inches. Sorcerer's Wand - WITCH BL31 - Approximately 14 inches. Sorcerer's Wand - SAME NAME ELDER BL21 - Approximately 14 inches. 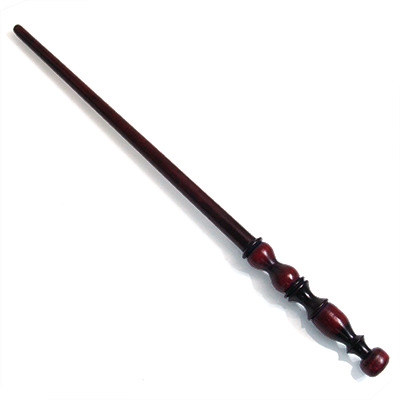 Sorcerer's Wand - SAME NAME ELDER OR PRONGS BL3 - Approximately 14 inches. I ordered the Sorcerer's Wand - SORCERER as I wanted a wand that gave the feel of a real magic wand over a magician's magic wand. Not only did it look the part, but it is nice and solid (Mind has survived being dropped, banged and stepped on!) without being too heavy. If you're looking for a Harry Potter style wand, these are the way to go. Plus they come in a variety of styles, colours and lengths.